Take I-95 South to Delaware exit 3, Route 273 west. Follow Rt. 273 all the way into Newark, crossing Rt. 2. 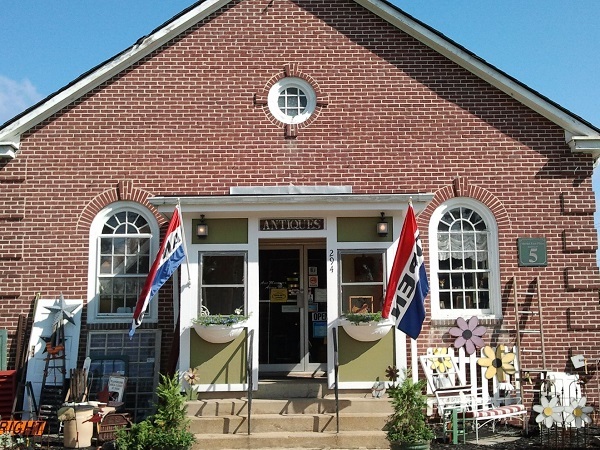 Aunt Margaret’s Antique Mall is the brick building located just after Kelway Plaza on the right. I-95 North to Maryland Exit 109B, Route 279 north (also called Route 2). Proceed on this road which becomes Elkton Road into Newark. Follow Elkton Rd. all the way into the city. You will be forced to veer right onto Delaware Ave. Follow Delaware Ave. to Tyre Ave. (near Newark HS). Turn left at Tyre Ave. Cross Main Street into the parking lot of Market East Plaza. Aunt Margaret’s Antique Mall is the brick building on the right. Open 10-5 Monday through Saturday, and 12-5 on Sunday.